The cover of the module, with art by Larry Elmore. Journey to the Rock is an adventure module written by Michael Malone and published by TSR, Inc. in 1985, for the Basic Rules of the Dungeons & Dragons fantasy role-playing game. It is intended for player characters of level 1-3. Journey to the Rock is a wilderness scenario, which includes rules for wilderness play. The wizard Lirdrium Arkayz wants to know the secret of 'The Rock' and hires the characters to uncover it. The player characters are hired to find the secret of "the Rock", and to get there they must pass through a perilous countryside using one of three possible routes. 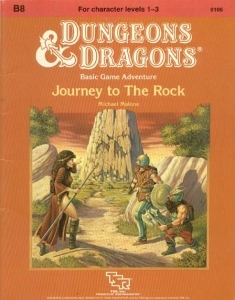 Journey to the Rock was written by Michael Malone, with a cover by Larry Elmore, and was published by TSR in 1985 as a 32-page booklet with an outer folder. Wendy J. Rose reviewed the module in Imagine magazine, giving it a positive review. She felt that the plot was sound if unoriginal and that the module was noteworthy as, unusually, almost all the action takes place outdoors. According to Rose there are plenty of good opportunities for roleplaying, it is not just "hack-and-slay" and the module contains several interesting new monsters. However, she also criticized a number of things: the quality of production is "rough in places", space is wasted by repetition of rules, and the English is "stilted". The gamemaster has to be very familiar with the module, according to Rose, but she noted that it compares favorably with the others of the B series and is a "good buy". This module was lampooned by the website Something Awful on July 22, 2010. ^ a b Rose, Wendy J. (September 1985). "Game Reviews". Imagine (review). TSR Hobbies (UK), Ltd. (30): 42. This page was last edited on 10 October 2018, at 03:50 (UTC).